Colaborate is a big show for C-level executives and up for the three big Oracle User Groups. Last week at Percona Live was all MySQL, Open Source, and a few hundred close folks. This week is the biggest show, after Oracle Open World, on the Oracle user calendar and draws a huge crowd from around the globe. All the Fortune 500 are here or their contractors. In short, anything tangential to any Oracle product can be found along with companies that offer add-ons, support, consulting, and product. A lot of the attendees have MySQL in their computer rooms and that is why I am in Las Vegas. 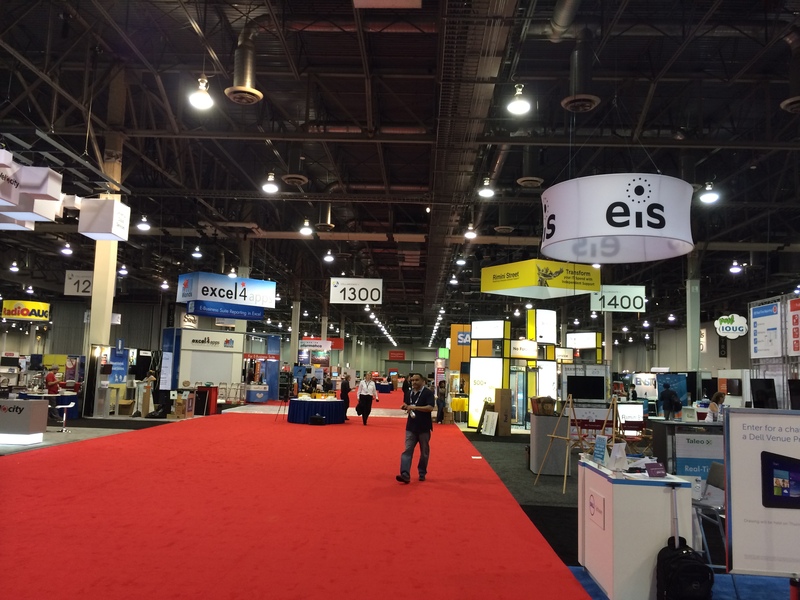 Collaborate is a huge show that is the Independent Oracle User Group’s big yearly show and for 2013 it will be in Denver. There are several MySQL sessions of note and I have noted some below. By the way i will have new MySQL stickers available at the MySQL Demo Pod on the show floor but rules say I can not just leave them around — you will have to ask for them. 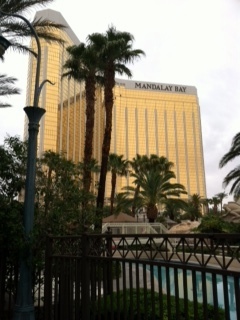 Collaborate 12 is in Vegas and Collaborate 13 will be in Denver. Mark your calendars now! The MySQL sessions at Collaborate started strong after an amazing keynote by former astronaut Mark Kelly about working to become a naval aviator, astronaut, and helping his wife — Congresswoman Gabrielle Giffords — after an assassination attempt on her life last year. 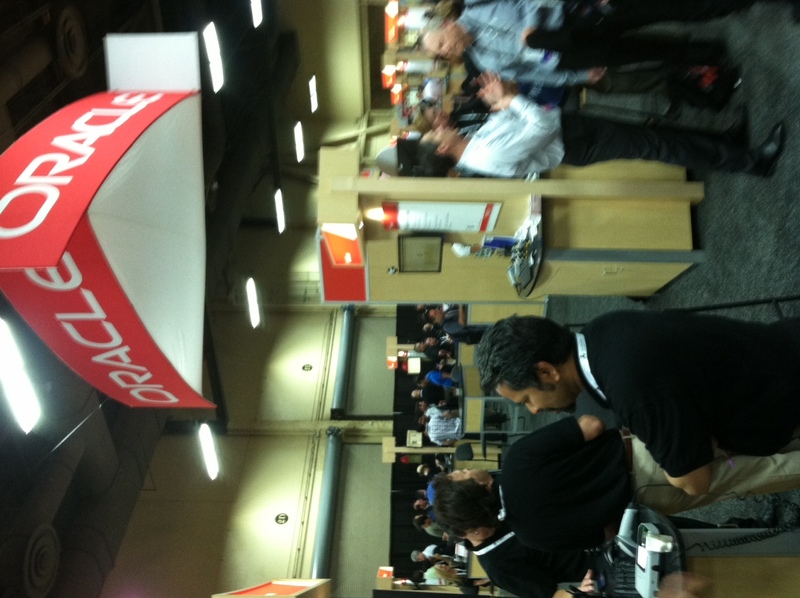 A rare moment when the Oracle demo pods where not wall to wall people. First up was Set up MySQL in Five Minutes by Bob Burgess of Radian6. Most of the attendees to these sessions seem to be long time Oracle DBAs looking to add more MySQL skills or long time Oracle AND MySQL DBAs. Bob then had a second session and covered Shell Scripting for MySQL Administration where most of the crowd of twenty had already had lots of shell programming experience. in Las Vegas. Below is a list of the MySQL sessions. And besure to stop by the Demo area to see some new MySQL goodies! Conference season is rapidly approaching and the MySQL Cluster product team will be out on the road, sharing the latest and greatest news on best practices, use-cases and developments. These will be valuable sessions for users who to learn more about building write-scalable, real-time transactional services with 99.999% availability, using a variety of SQL and Non-SQL (dare I say "NoSQL") interfaces to their data. - The State of MySQL, 09:15 - 10:15, Monday April 11th to be delivered by Tomas Ulin, VP of the MySQL Engineering Team who will discuss the strategy for MySQL product development, including directions for MySQL Cluster.